A big thank-you goes to all who have signed our initiative. And very special thanks go to all who have supported our campaign as activists spreading the word in so many cities and villages all over.. Europe, gathering signatures, and donating. We all are pioneers, exploring and implementing a new instrument for participative democracy. As pioneers we have to take some risk. Nobody knew in advance how easy or difficult it might be to get all the support needed. It has turned out that the aim of getting one million signatures was out of reach, as it was for the organisers of many other ECI s. But we have managed to establish an amazing network of people who are committed to have wide 30 km/h speed limits and make our cities safer and more attractive places to be. 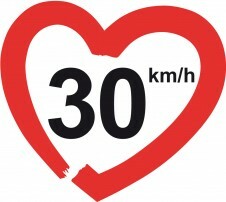 And the issue of 30 km/h as default speed limit is now on the European agenda! We have also inspired many communities and will continue to do so. There will be more opportunities to achieve our goal, including a couple of additional ways to convince the EU. Be sure that this ECI has been just the beginning.